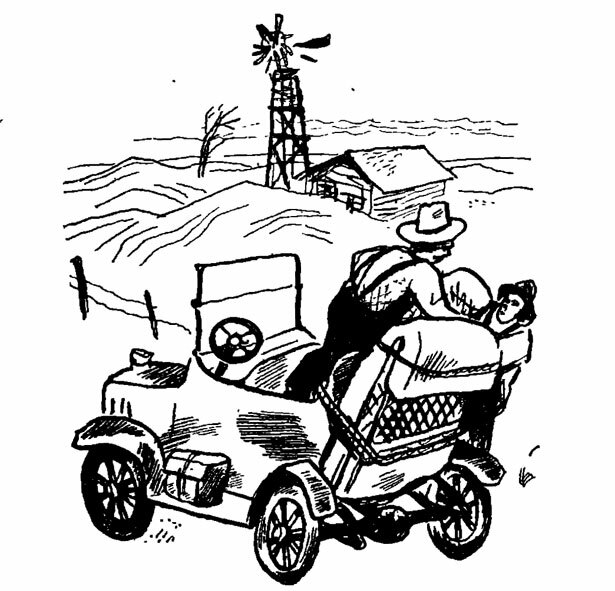 In the summer of 1937, with the original Dust Bowl and the second wave of the Great Depression in full effect, The Nation published four features, once each month, by the radical cartoonist and painter William Gropper, who, using Works Progress Administration funds, went on a tour around the country to document the resilience with which ordinary people were facing those twin man-made disasters. 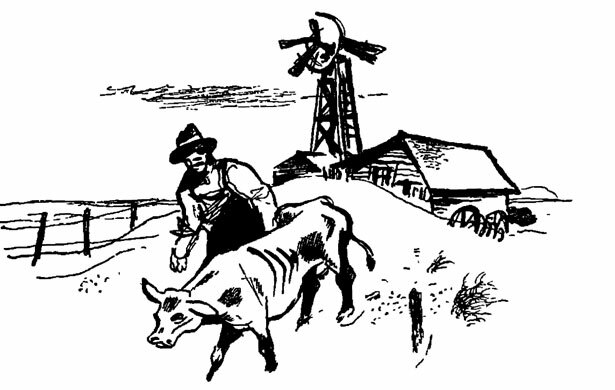 Gropper’s simple, evocative sketches and crisp paragraphs have the same effect as more famous artifacts of creative reportage from the American West of the late 1930s, like John Steinbeck’s novels or Woody Guthrie’s songs: that of making the reader or listener feel dusty just by reading or listening. When the wind blows, you get a blow of nice hot dust in your nose, eyes, and throat. The landscape is simple—sky and sand for miles. At night you can get some sleep with a wet cloth over your face, or if you’re prepared with a mask you can manage to get by until you get used to it. In Elkhart, Kansas, I saw a farmer plowing. 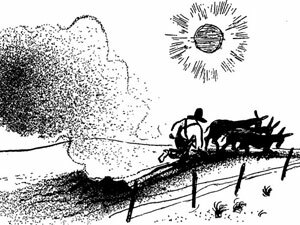 No sooner did he pass with the plow than the dust blew over and covered up the earth as if nothing had happened. I asked him if he got any crops, and he said, “No.” “Then why plow?” And he said, “Been doin’ it fer years; it’s a habit now,” and went on with his plowing. More than once on the road I’ve seen families packing their belongings in old Fords and leaving the old homestead. Many of them, I’ve been told, are migrating to California—not because they want to, but because they have been evicted. The Dust Bowler, seeking means of combating these terrible conditions, went first into causes and found that he was having to fight more than super-temperatures, water shortage, and constant wind-whipped dust. He was having to fight the mistakes of his predecessors. The high plains have never had abundant rainfall. But when the annual precipitation of from fourteen to twenty inches decreased to from eight to fourteen, the situation became acute. “Dusters” began to boil up and shut out the sun, and everywhere the question was asked, “What shall we do?” It was a question that remained unanswered for many months while gas engines refused to run and locomotives crawled through a springless, viewless land—a land where people live with windows weather-stripped tightly with adhesive tape to exclude the penetrating silt; where wet sheets were hung above beds and about the walls to save the lives of the old, the ill, and the new-born…where a weird purplish sun guided the funeral procession of those who had died of dust pneumonia. Abramsky reports that not only is the present drought crisis in the Southwest, to some extent, a human-caused phenomenon, it continues to be exacerbated by a broken American political system. Congress has an opportunity to address this crisis through the farm bill, which is currently the topic of robust debate in Washington. On July 11, with help from the powerful agribusiness lobby, the House passed legislation giving large farms the ability to buy “shallow loss insurance,” which would guarantee up to 90 percent of their income—thus providing a perverse incentive for agribusiness to try to cultivate land manifestly unsuited to the crops in question. Sure enough, the farm bill passed by the House earlier this month—in addition to stripping out the food-stamps program, thereby sundering the traditional farm-bill coalition in two—disconnected conservation compliance from crop insurance payouts, essentially declawing the bill’s already insufficient environmental-protection provisions. 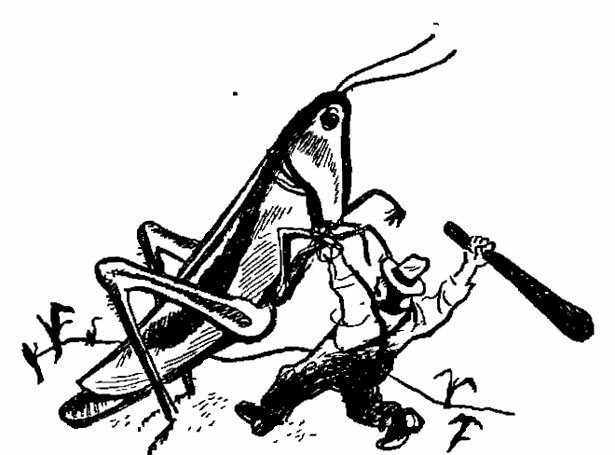 If the new Dust Bowl gets any worse, we may have to start looking for the next William Gropper.